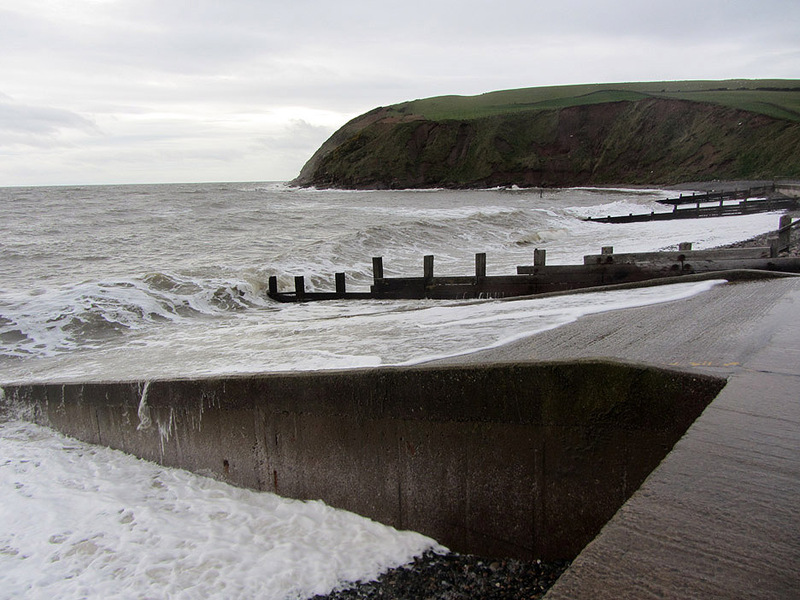 " St Bees on a Winter's Afternoon "
Date & start time: Saturday 7th December 2013, 2.45 pm start. 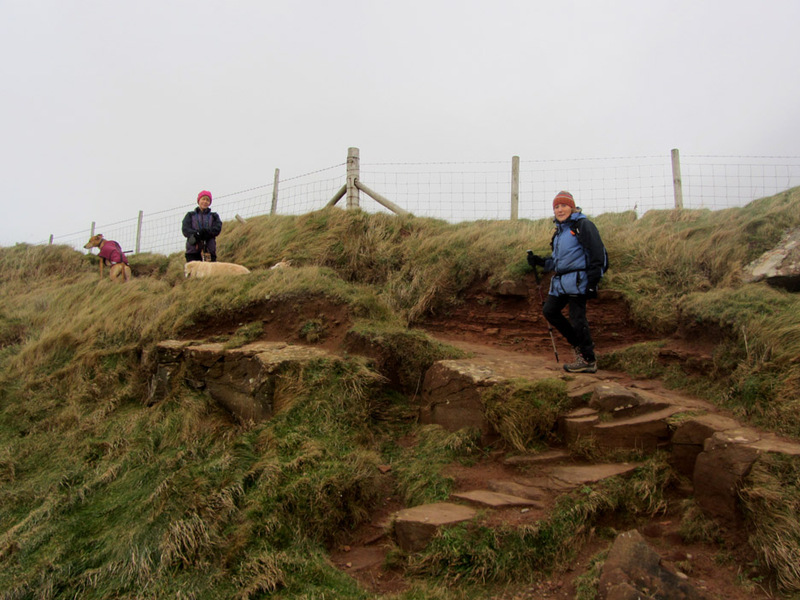 Walk details : 2.75 mls, 575 ft of ascent, 1 hours 55 mins (refreshments extra). 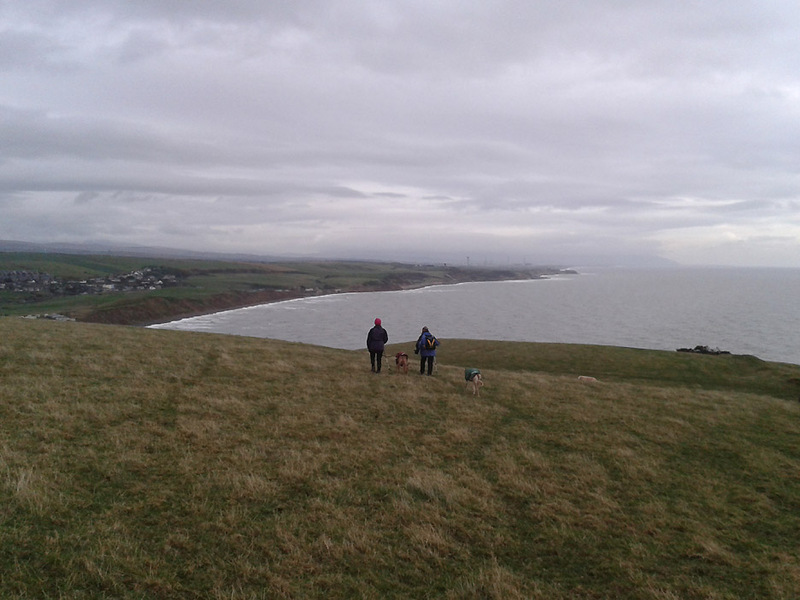 Walked with : Ann, Jo and the dogs,Jodie, Amber and Harry. 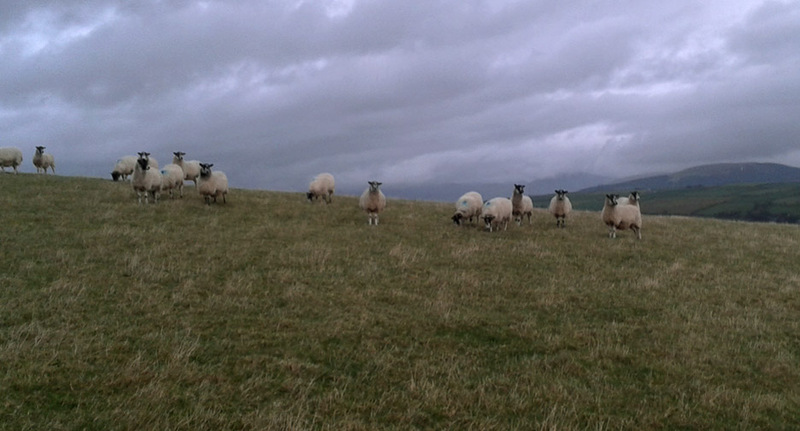 Weather : Breezy but dry, with cloud on the high fells but less on the coast. The breeze was up and the clouds were down while Jo was visiting Loweswater for the weekend. 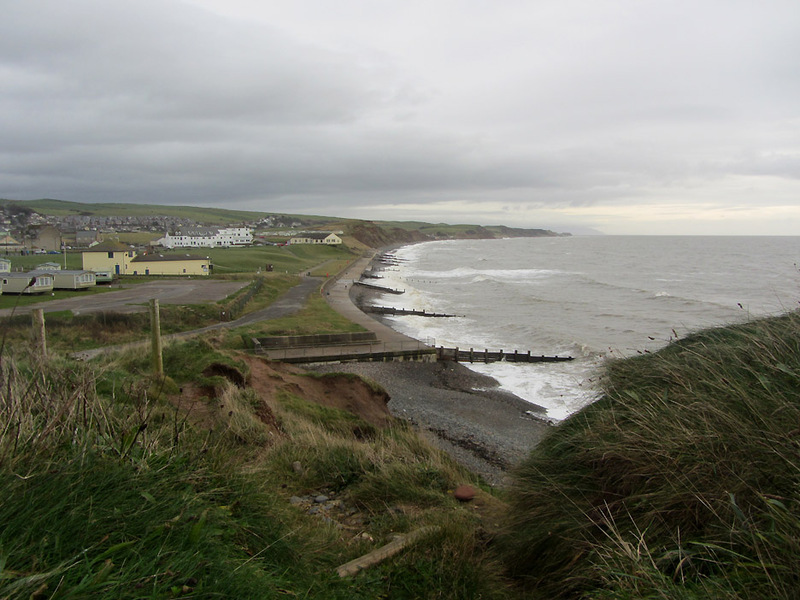 A decision to do a local walk from Felldyke was changed en-route as we saw clearer weather at the coast. to allow us to promenade the seafront and walk up onto the headland for some fine views. 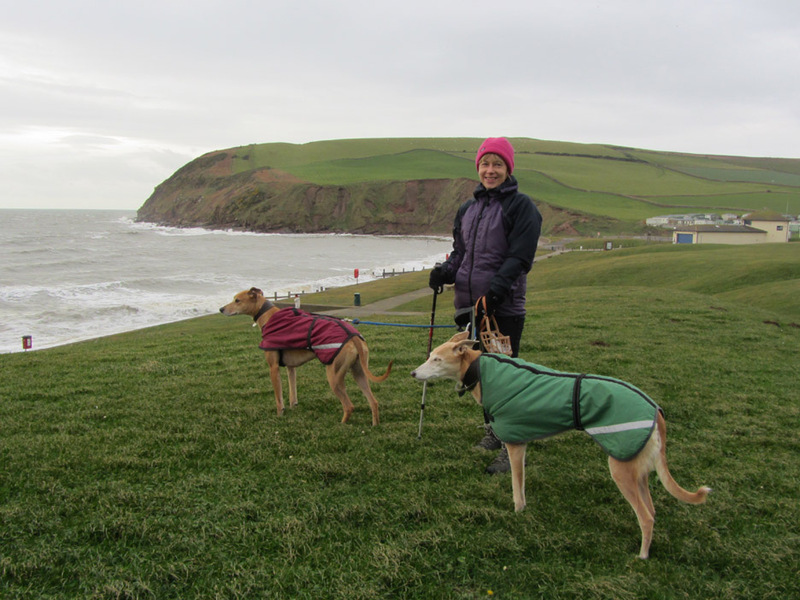 Jo with her two dogs at the start of the walk at St Bees. 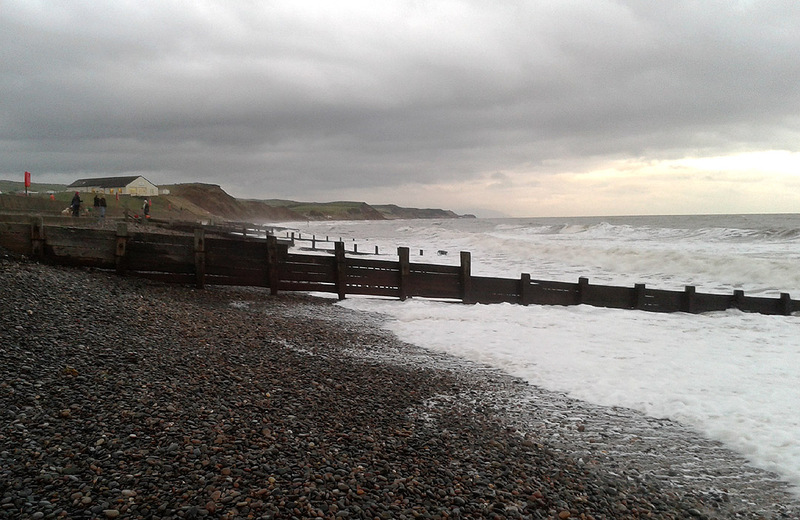 There's still a good sea running and the tide was high so there was no sign of the sandy beach. Recent storms have left a large number of pebbles from the beach high up on the grass. 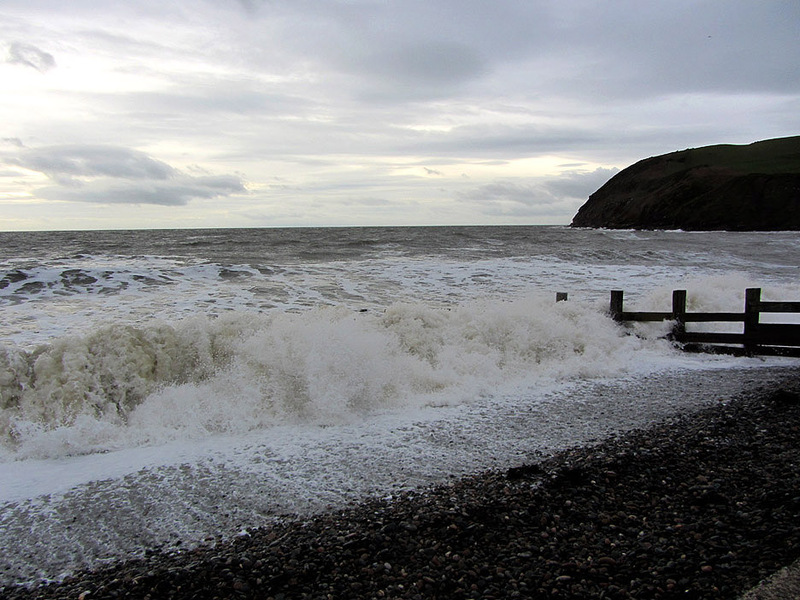 Clear air and long distance views add to the spectacle of today's large waves. 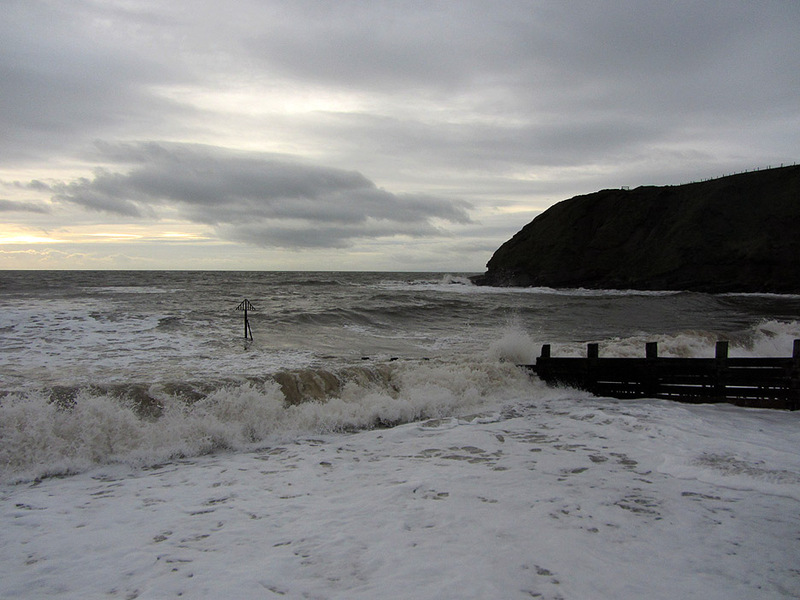 The ramp to the beach allowed the waves to flood up onto the promenade. It is also from this ramp that the inshore lifeboat can be launched if required.
" Check that the spray from the last wave hasn't landed on your lens ! " 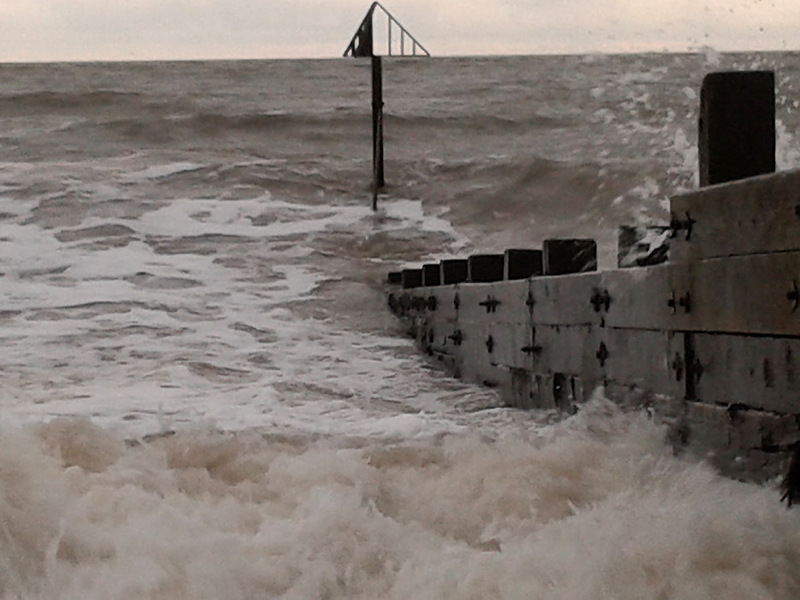 The groyne at the northern end of the promenade has a triangular marker at the seaward end. The waves have an almost hypnotic effect as we stand and watch. 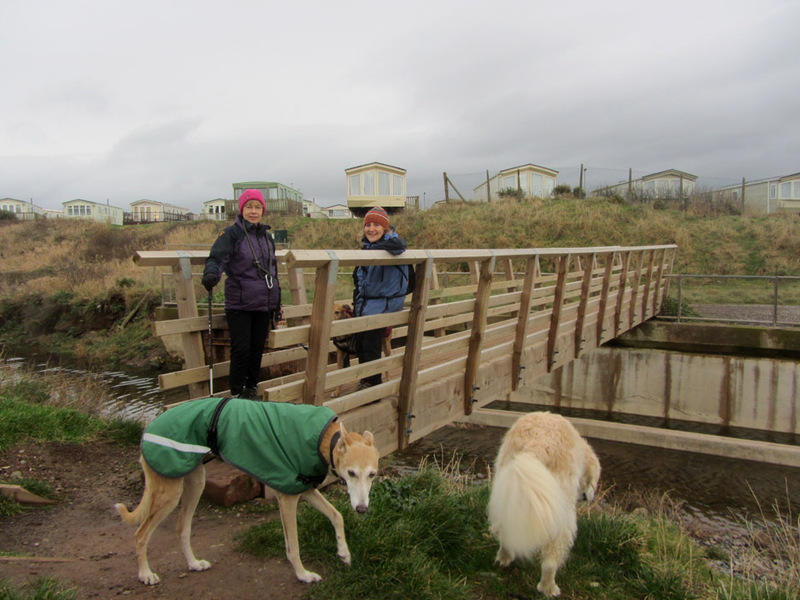 At the end of the bay there's a new bridge over the Rottington Beck stream. The action of the waves has built up the pebbles across the stream exit . . . so the water now has to drain away through the stones. We set off up the headland. 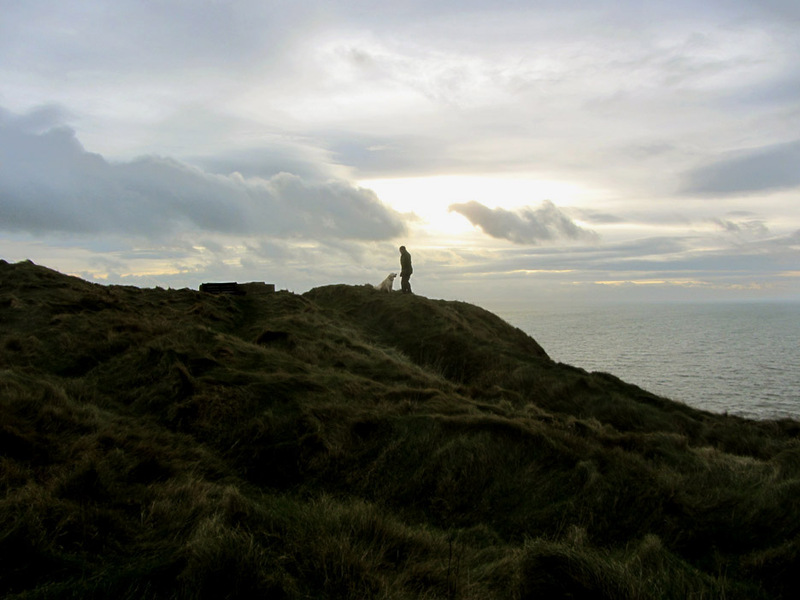 Coastal erosion over recent years has undercut the cliff so the old path is now too close to the edge to use any more. 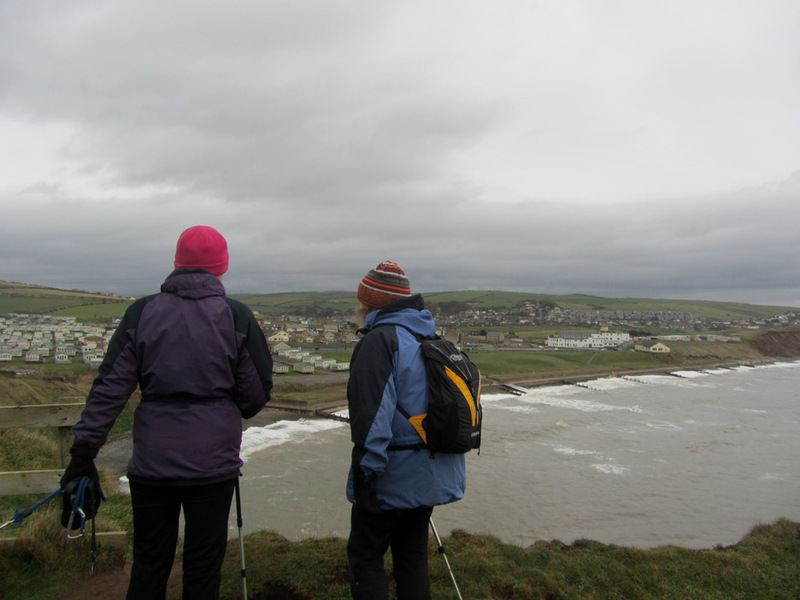 Jo and Ann look back on the caravan park at the northern edge of the village. 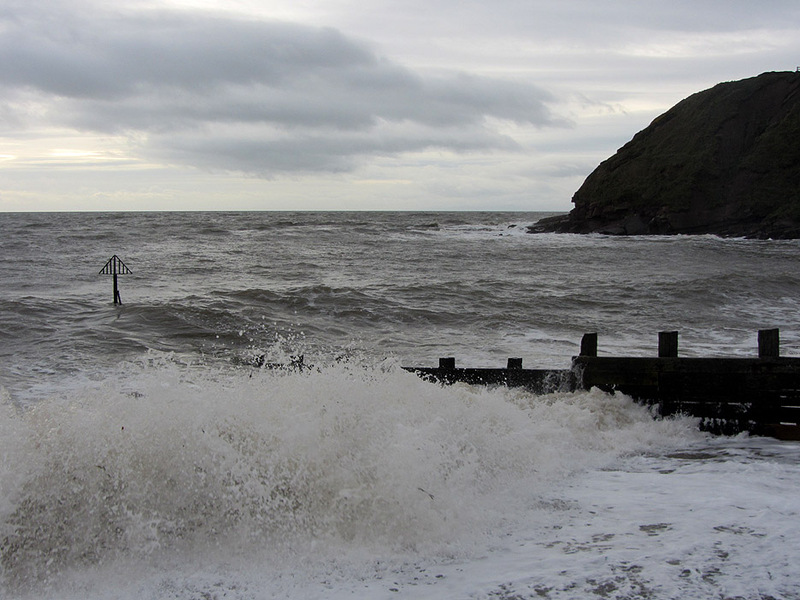 A wider panorama of St Bees Bay. 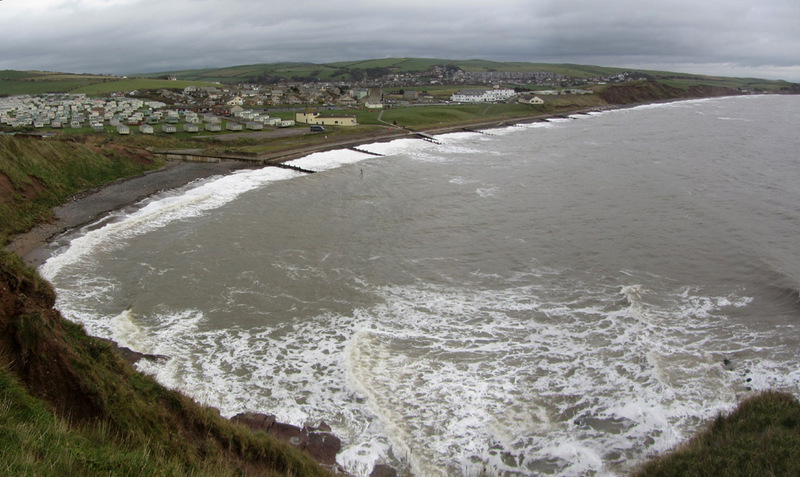 The inshore lifeboat house is the cream coloured building in the centre. 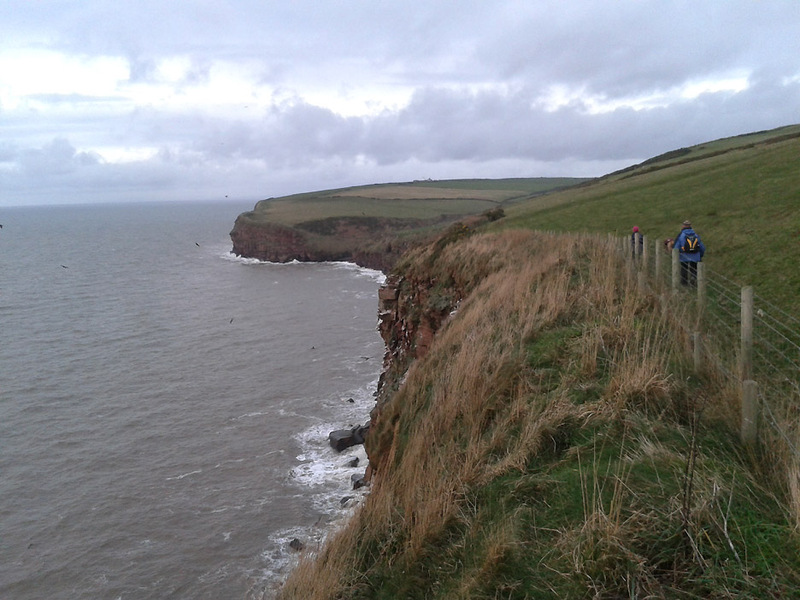 The new path stays inland from the cliff at this point and climbs along the route of an old field boundary. 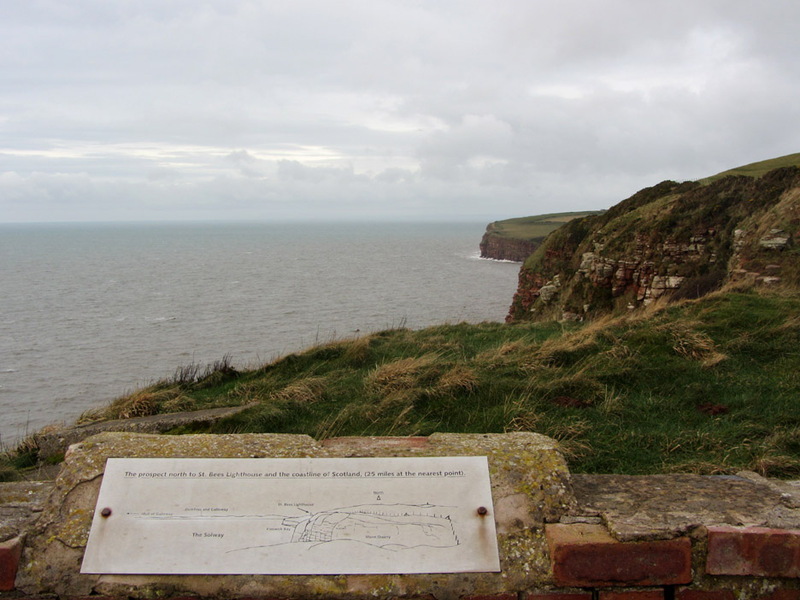 South Head and the viewpoint at the old Tomlin Coastguard position showing . 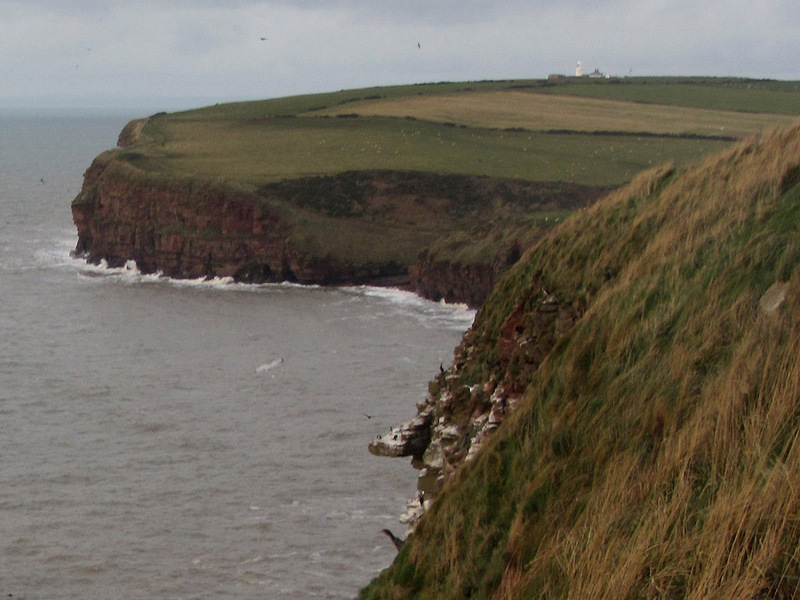 . .
"The prospect north to St Bees Lighthouse and the coastline of Scotland (25 miles at the nearest point)." 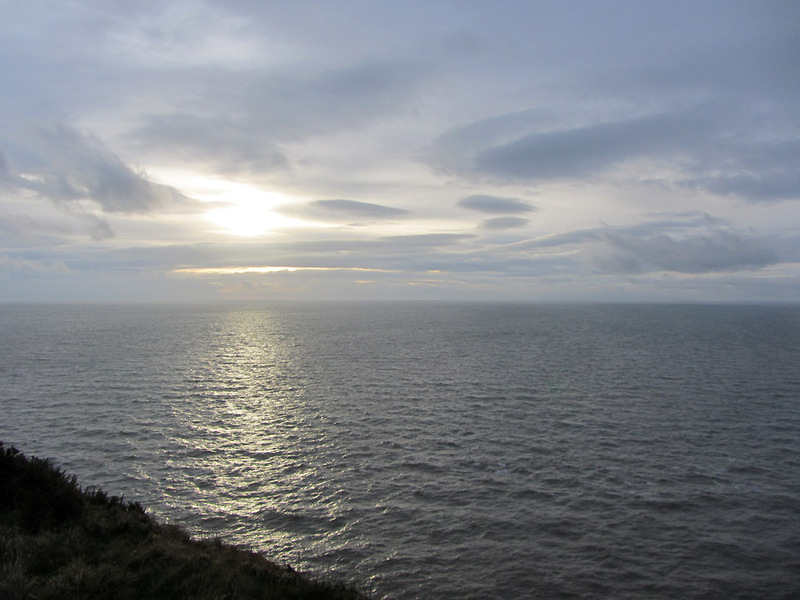 We have sufficient time to continue further along the headland . . . the girls take the lead. as the sky behind provided a nice silhouette-style photo opportunity. 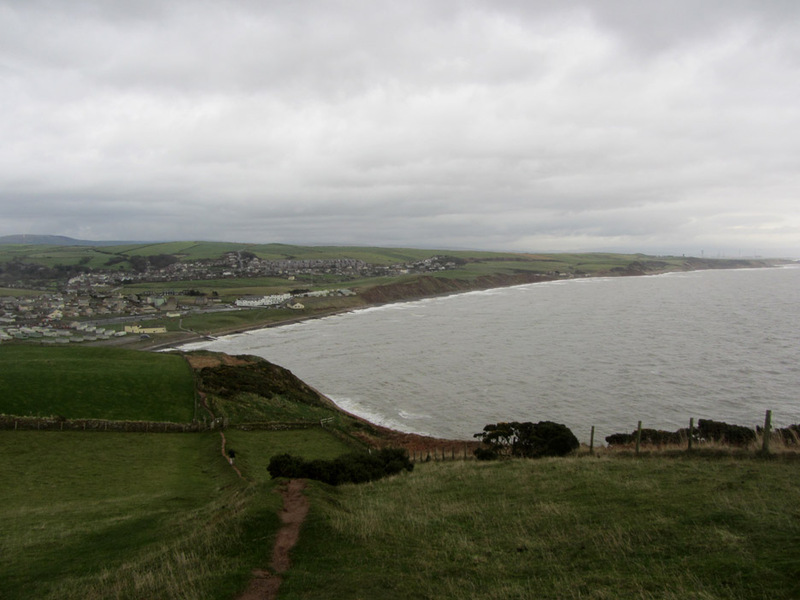 We walked a little further along the coast path until we had a view down into Fleswick Bay. just a few of them could be seen by carefully holding the camera out over the fence. Over the sea to . . . a hazy Isle of Man . 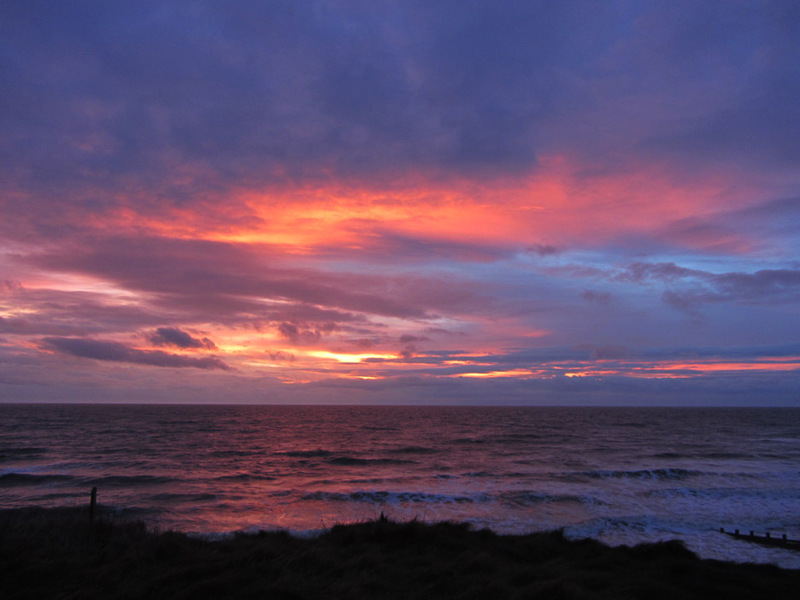 . .
but the sun has found a gap in the clouds and was producing a lovely reflection on the rough sea. Suffolk Sheep . . . the name of the breed . . . not implying the animals are on holiday ! 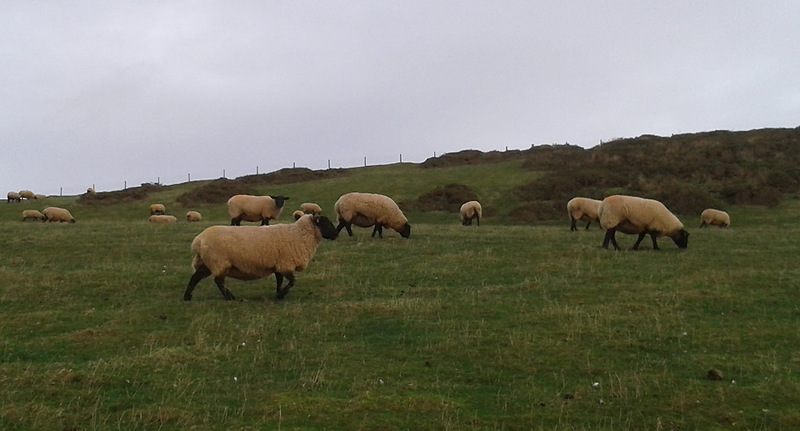 In an adjacent field, Swaledale sheep on Cumbrian coastal pastures. The cloud is still down on the high fells behind so our choice of walk today was a good one. On the way back now as we cut the corner slightly, missing out on a return visit to the old shelter. Back on the beach . 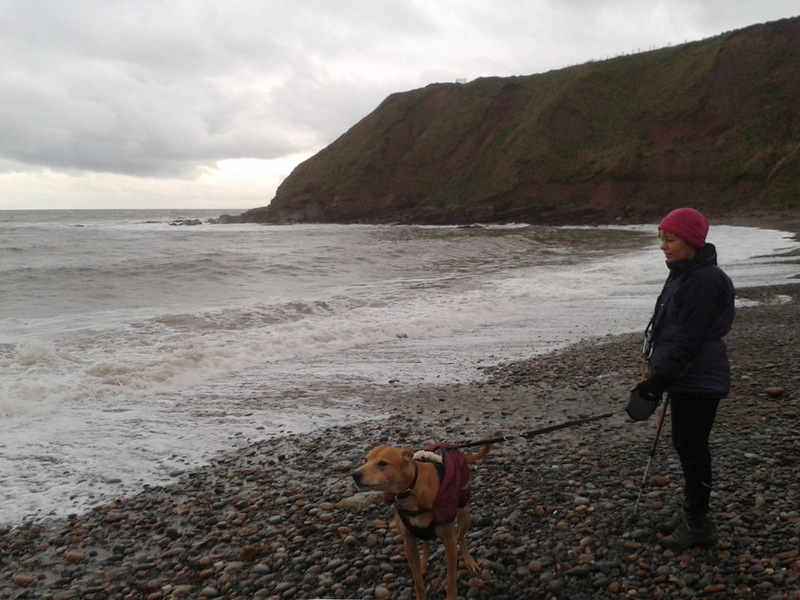 . . Amber is uncertain what to make of the waves. thereby protecting the sandy bay for the tourists and also cutting down on coastal erosion. but you'll get the mood of the day . . . hold your cursor over the picture to catch the wave. 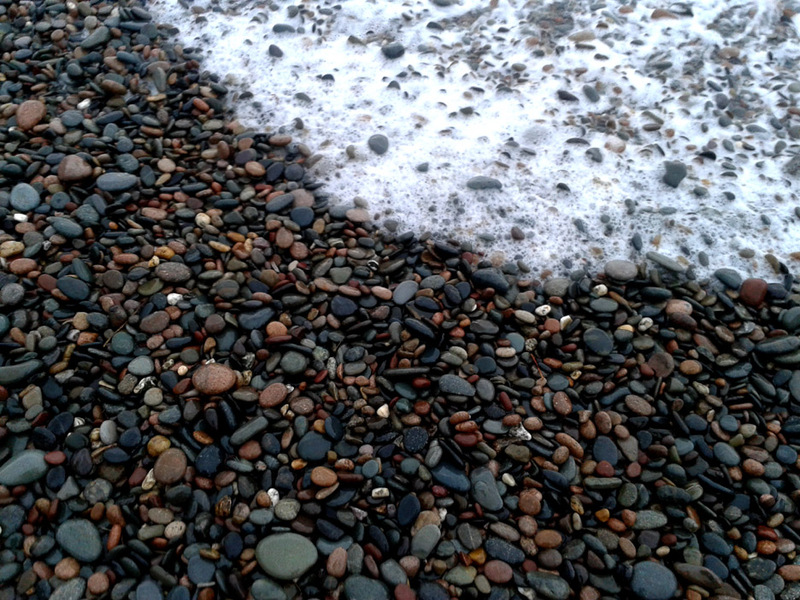 Colourful pebbles, reflecting the variety of local geology, all rounded and smoothed by the action of the waves. 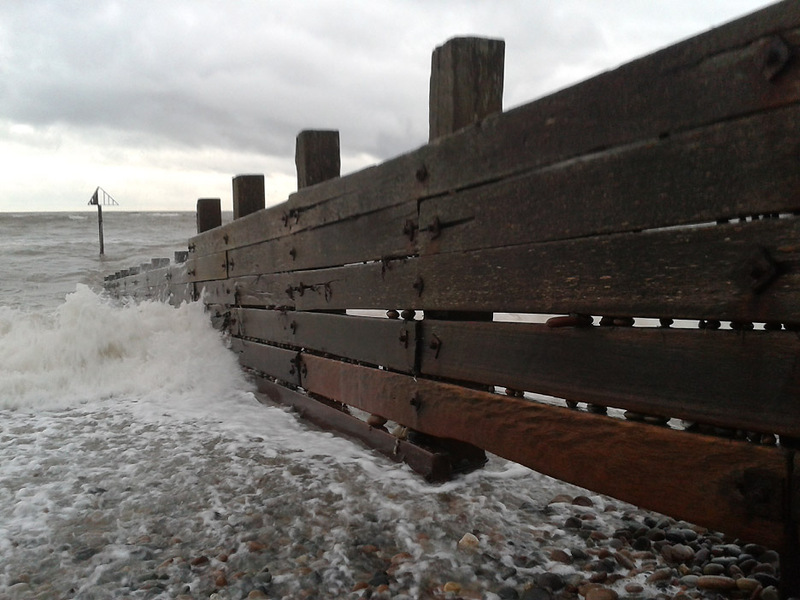 Back along the prom with a slight diversion onto the pebbles for close-ups of the sea. 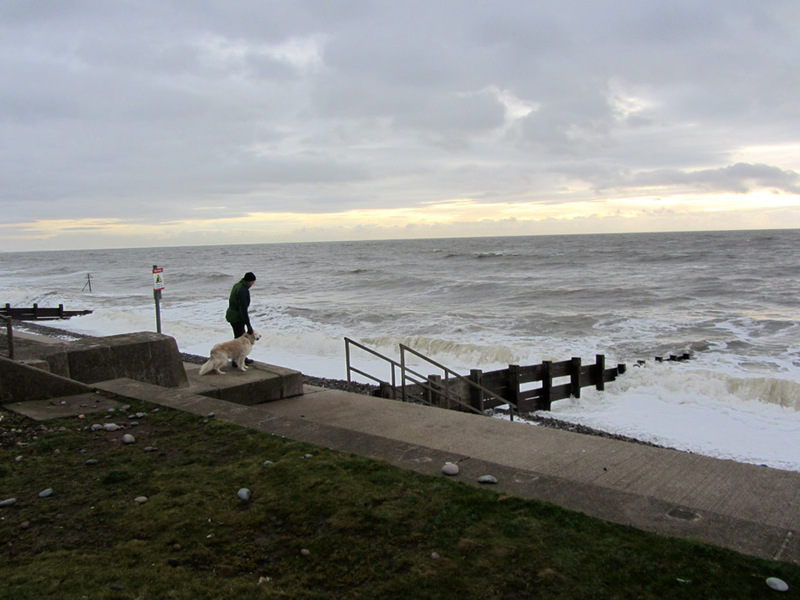 Our next port of call, once we had returned the dogs to the car, was that building at the back of the beach. 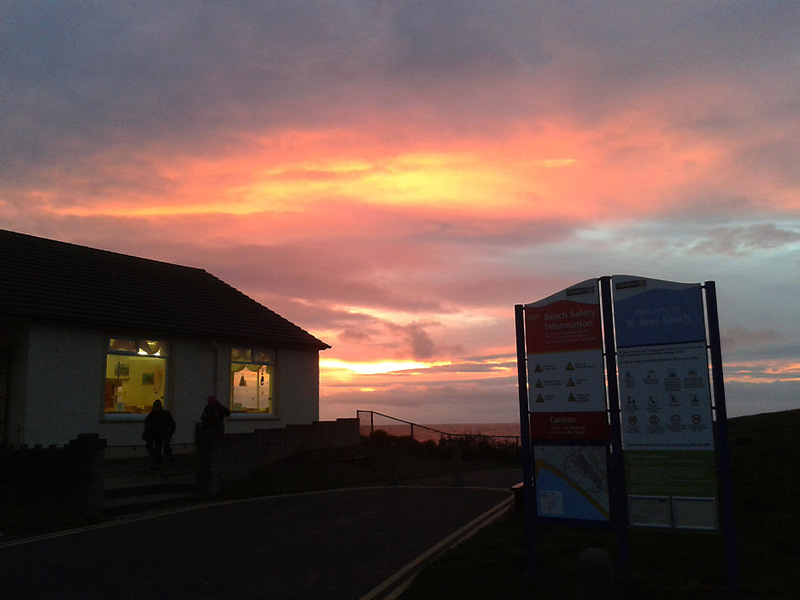 The reverse view, taken this time from within the beach cafe. Hartley's is famous for local ice cream and they run the shop and cafe in St Bees. Today we'll pass on the 'cold specials' in favour of a warming pot of tea. Being close to sunset the colours were improving as we watched. As we were still indoors the lights of the ceiling were reflected in the window . . . no . . . it's not a couple of UFOs. That's better . . . outside now and no reflections . . . but who turned the wind up. We can't stay all day so we leave as the display reaches its peak. A last look as the light starts to fade. Technical note: Pictures taken with either Ann's Canon Sureshot SX220, or my Samsung Galaxy phone camera. This site best viewed with . 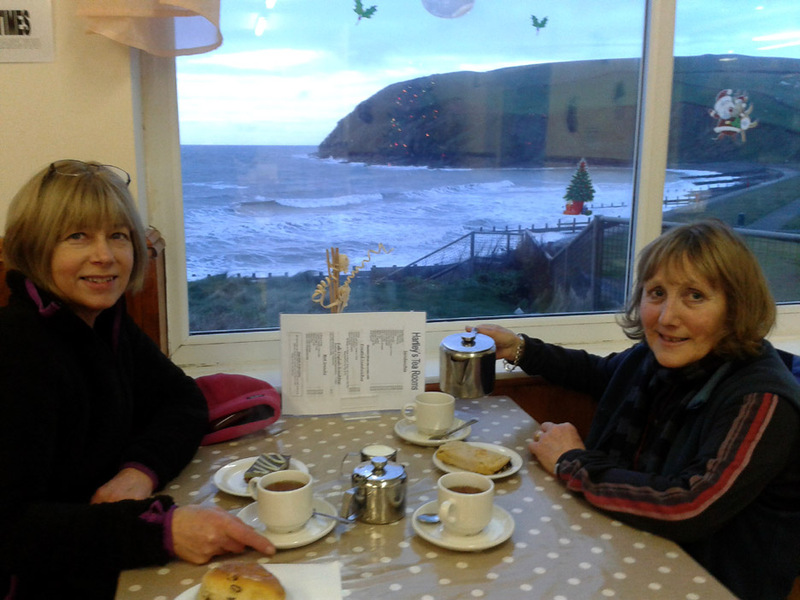 . . a windbreak pane of glass between the surf and the cup of tea. 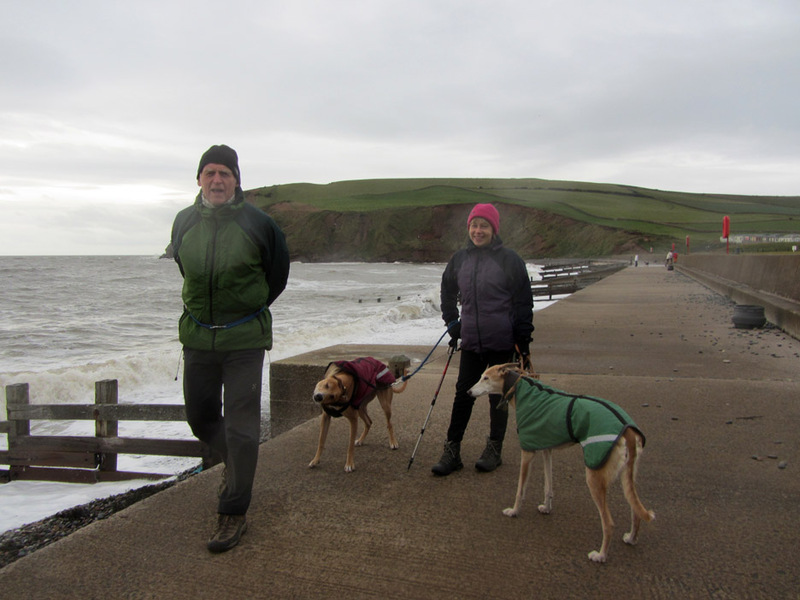 Previous walk - 4th Dec 2013 - Sherran, Bill and Angie.